I read the book Hello, Mrs. Piggle-Wiggle first (late last year) and just completed reading Mrs. Piggle-Wiggle, which makes everything make more sense! 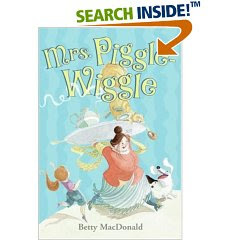 I wish I had started with the first book, because it gives a better description of who Mrs. Piggle-Wiggle is (and what she looks like) but, nevertheless, I found both books rather enjoyable. I came across the Mrs. Piggle-Wiggle books through a recommendation on Semicolon's Saturday Review. (My apologies! I deleted my link for who the recommender was!) I'm glad I did for I thought this was a cute idea. For those of you unfamiliar with Mrs. Piggle-Wiggle, she is an "old maid" who knows how to cure the worst of childhood bad behaviors, such as slow-eater-tiny-bite-taker issues as well as the won't-pick-up-toys ailments. Her methods are creative and effective. The parents in her small town would seem to be clueless without her! So, I suppose, thank goodness for Mrs. Piggle-Wiggle! 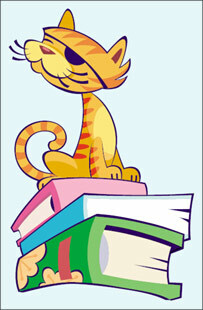 It's a cute series, listed as a good read for ages 6-10. However, I think it can be enjoyed by people ages 20+ if you still have an imagination about you. Actually, she's the widow of a pirate, and in some of the stories the children of the neighborhood search for pirate treasure in Mrs. Piggle-Wiggle's house. I loved those books when I was a little girl, and my children love them now. They know the stories so well that when one of them acts selfish, or like a cry-baby, or a slowpoke, the others can and do recite passages from the pertinant stories. I'm glad you reviewed them! I loved (!!) Mrs. Piggle-Wiggle growing up and found them to be hilariously funny. I haven't picked them up in awhile, but I might need to take your suggestion and re-visit them as a 20+ person. I'm glad you liked them! I simply MUST HAVE Mrs. Piggle-Wiggle! And read Onions in the Stew - which is her memoir of living on Vashon Island with her twin daughters, Anne and Joan (who were obviously the inspiration for many of Mrs. Piggle-Wiggle's cures), and her husband, Don. It's hilarious! I LOVED the Mrs. Piggle Wiggle Books!!! I need to add yet another to my must-read list. Somehow I missed this one growing up. Sounds fun! I read these books when I was in grade school. They're hilarious! I agree with you, artwork on the older editions is much better.